Twin Peaks O.S.T Limited 180gm 'damn fine coffee' colored vinyl LP pressing in gatefold jacket with director approved artwork. Gatefold sleeve housed inside a bespoke white die cut outer jacket with white spot varnish finish, complete with obi strip Sleeve notes By Angelo Badalamenti. Vinyl re-master by Tal Miller. Laquers cut by David Cheppa at Plush Vinyl. "I'm glad that after 25 years, Death Waltz Recording Company has re-released the original soundtrack for Twin Peaks for a new audience to enjoy. This is my defining work as a composer and I'm happy it will get a fresh listen" - Angelo Badalamenti (2016). 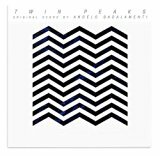 Composed by Angelo Badalamenti, this is the official soundtrack to the television series Twin Peaks (1990-91). The series' co-creator David Lynch produced the album alongside Badalamenti and wrote lyrics for several tracks, including the series theme song "Falling".